Store and display your stemware in a unique and stylish way with this tiered spinning metal wine freestanding wine glass holder. This matte black wine rack features a unique 2-tier design, each tier rotates so you can easily store and use the glasses no matter where this stand it displayed. The circular style holds up to 10 glasses of stemware, 5 on each tier and a small decorative candleholder sits atop. With a durable construct and modern style, this tabletop rack is casual enough for you kitchen counter, but elegant enough for a bar or winery. **Official MyGift® product. ** Stemware not included. Approximate Dimensions (in inches): Overall - 24 H x 13.5 D. Candleholder - 3.5 Diameter. Contemporary design tiered wine glass storage rack with matte black powder-coat finish. Features 2 rotating tiers holding up to 10 wine glasses upside-down for storing or drying. 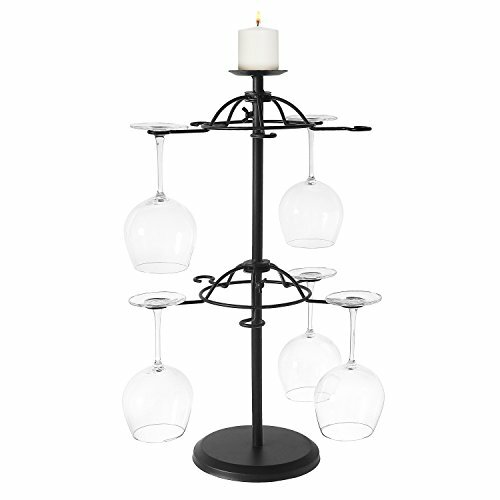 To add to the elegance a decorative 3.5-inch candleholder sits atop the wine glass rack. Stemware and candle not included.